166. Human Behavioral Biology: Species Evolution On A Molecular Level – How to Shape Human Behavior. 00:03:05 Recall from the previous lecture Intersexual Competition & Male/Female Hierarchies that heritability is the notion that, until proven otherwise, behaviors are genetically influenced. On a molecular level, proteins are made up of roughly 20 amino acids coded for a different DNA sequence, and there are roughly 60 different ways of coding for amino acids. These roughly 20 amino acids are structurally responsible for holding your cell shapes together, forming messengers, hormones, neuro-transmitters, enzymes… Proteins are what get your cells to do what they are supposed to do. One of the most interesting things that proteins do is act as enzymes which speed up the process of putting together and pulling apart molecules. If you know the sequence of DNA, then you’ll know the sequence of RNA, the amino acid sequence, the resulting protein that is made as well as the shape and function of the protein. This tenet has since been disproved. Viruses are foreign DNA which hijack another DNA and force it to do what the virus wants it to, thus changes the RNA and the proteins. There is also a class of enzymes which can attack RNA and turn it back into DNA and then hijack it for it’s own objectives. A point mutation is when one letter in the DNA sequence is changed into another letter. A deletion is when one of the letters in the DNA sequence gets lost. An insertion is when one of the letters in the DNA sequence gets doubled. 00:27:03 In modern times, 12 years old is the Westernized average time little girls start puberty and begin menstrating. Testicular Feminization Syndrome is a condition where genetically the human is a male complete with testes which make testosterone, but the testes never descended, and so is mistaken for a female. All of these protein and receptor mututations effect humans evolutionarily in slow, predictable and incremental changes; changes we can identify and predict. 00:40:51 FOXP2 is an example of a genetic protein mutation that happened to humans, and is what gave humans the ability to develop speech and language. Versions of FOXP2 occur all throughout the animal kingdom. You share 98% of your DNA with chimpanzees, yet on average only 50% of your DNA with your full siblings. To simplify, genes specify traits: kidneys, bones, antlers, etc. So right from the start you share genetic similarities with other species which also have kidneys, bones, pelvises designed to walk upright, etc. Why you have less genetic similarity with your full sibling versus with a chimpanzee comes down to coding not for the different genes, but for the different ‘types’ of genes. This is a different world of variance. 00:52:31 In the 1980s Steven Jay Guld and Niles Eldredge came up with the theory of punctuated equalibrium: that evolution isn’t being driven by small gradual changes, but rather long periods of stasis where nothing changes followed by short periods of rapid change, and then back to stasis. The logic behind punctuated equalibrium was due mainly because Guld, a Marxist, wasn’t a biologist, but rather a paleontologist who studied fossils and traced the evolutionary lineage of change in a species through time. In the world of paleontology, you don’t have clear logical steps showing the evolution of a species as viewed from their fossils, but rather gaps in time which can neither be explained nor tracked. And as more and more data are discovered about the species, you see great similarities over time, and then gaps in the evolution where things had changed drastically over a short period. Paleontology and a evolutionary biology come from completely different universes and measure time through different orders of magnitude. Paleongology is only concerned with the fossils and morphology of organisms, not the smaller genetic modifications such as brain activity and development, behavior, and the number of chambers in the animal’s heart, etc. 01:07:10 Nobel Prize winning biologist David Baltimore found that one gene can have its protons and exons combine in many different ways. This finding was also ill-received by the scientific community which held that one gene only specifies one single protein with no variation. 01:25:14 If then clauses in the molecular genetic world: IF you get a signal that there is low glucose in the cell, THEN you begin to make proteins related to glucose uptake. IF you smell your child, THEN you’ll experience a particular reaction. 01:29:16 Are genetics fixed or malleable based on the environment? Mothering style, such as how often a mother wakes her baby, can cause permanent changes to genes related to stress hormones, dictating how readily some genes will be turned on or off for the rest of your life. Epigenetics is the study of “variations that are caused by external or environmental factors that switch genes on and off and affect how cellsread genes instead of being caused by changes in the DNA sequence.” The researcher Steve Sumi who studies primate social behavior found that by simply changing the style of mothering that a baby monkey receives, and you change the confirmational access state of +4,000 different genes. Fertilization is all about genetics; development is all about ways in which the environment shapes behavior. 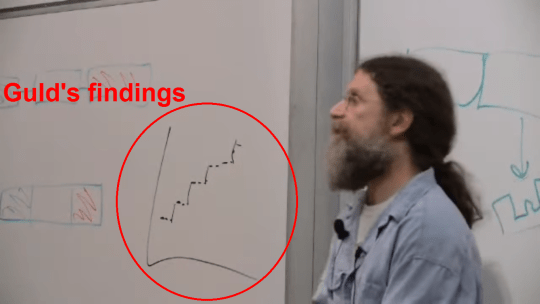 Posted on December 25, 2015 by Joshua SMITHPosted in interviewTagged human behavior, men, molecular genetics, Robert Sapolsky, Stanford University, videos, youtube.